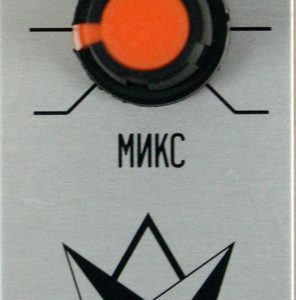 English Tear is a Eurorack-format voltage conditioning module specially designed to interface with the KORG MS series of synthesizers. 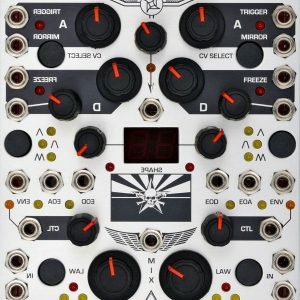 The systems differ in trigger polarity and frequency control law: the MS series using a “hertz per volt” scheme and the Eurorack with “volt per octave” scaling. 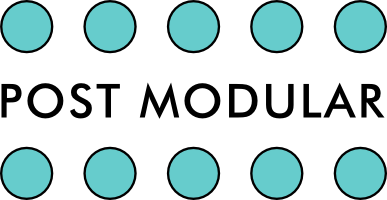 This module enables convenient two-way patching between the two systems with a minimum of user adjustment required. Two voltage processors to scale and invert an incoming signal, with optional offset. The output of each section is normaled to one of the nonlinear amplifiers described below. The first processor circuit features a second, unattenuated input for simple voltage mixing. An exponential amplifier for receiving a Eurorack pitch control voltage, and converting to Korg’s hertz-per-volt scale. 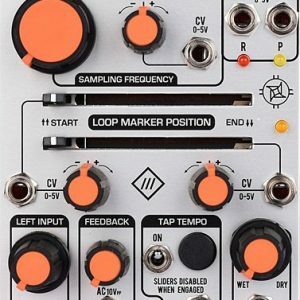 A logarithmic amplifier for scaling the MS-20’s keyboard voltage to suitably control Eurorack oscillators such as the Hertz Donut Mk 2. A pair of simple trigger converter circuits, for inverting the polarity of trigger or gate signals. This allows transient events from each system to properly trigger the envelopes of the other. In addition to the stated application of KORG MS voltage scaling, the English Tear has significant in-system utility in instruments of all sizes. The voltage processors provide additional scaling and mixing opportunities to CV inputs with limited controls, and the large offset generator knobs enable manual performance of a DC output voltage. 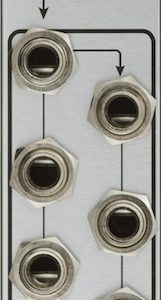 Multiple units may be patched together to enable analog computation functions uncommon in musical instruments.